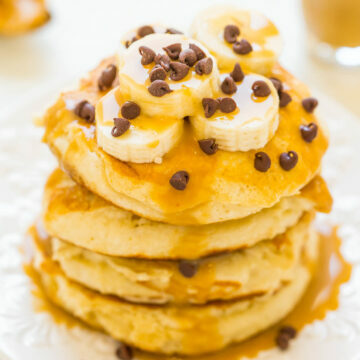 Peanut Butter Banana Protein Pancakes – Light, fluffy, EASY pancakes that pack 13+ grams of PROTEIN per serving!! 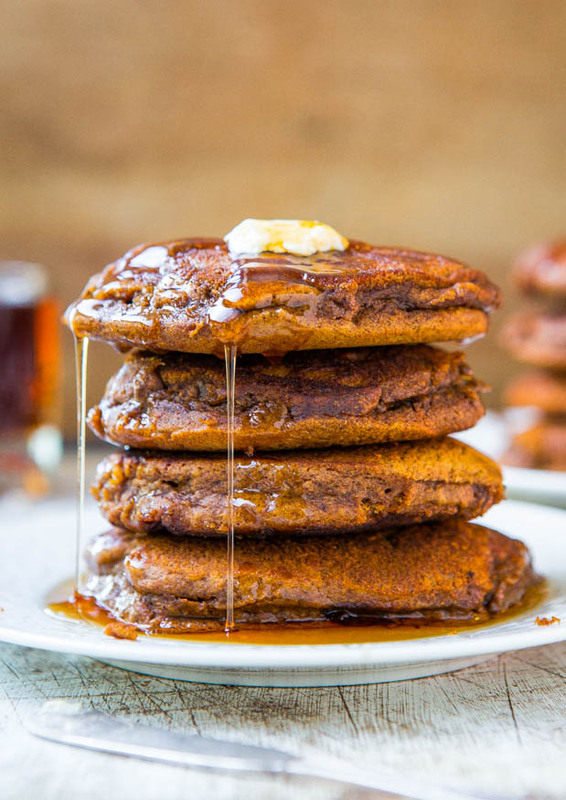 The peanut butter-infused maple syrup is rich, decadent, and you’ll never settle for plain maple syrup again!! 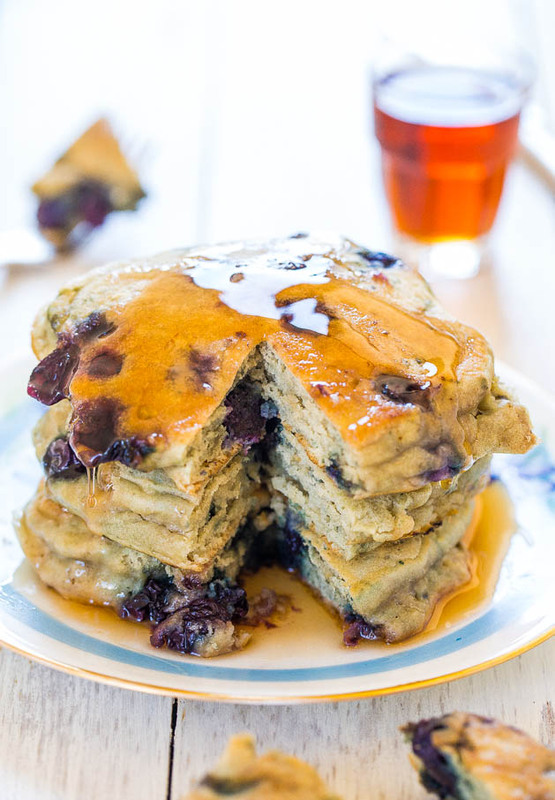 If you’re looking for extremely easy pancakes that are soft, fluffy, light, and pack extra protein look no further than this recipe. I used the new Krusteaz Protein Buttermilk Pancake Mix and it couldn’t be easier. You don’t even need to add milk or eggs. Just add the mix to a bowl and add water. I love that you don’t have to go out for buttermilk but can still enjoy the lovely taste of buttermilk pancakes with this mix. One serving of pancakes packs 13 grams of protein and if you choose to add eggs or milk to the mix, the protein quotient goes up even more. I made them with both water and milk and they were great both ways. I drizzled the pancakes with peanut butter for even more protein. Peanut butter that’s been infused into maple syrup of course. It’s decadent, rich, and the warm pancakes soak it up beautifully. I don’t know how I’ll ever go back to plain maple syrup after this ultra scrumptious version. I garnished the pancakes with bananas and I couldn’t resist adding a few chocolate chips. My daughter devoured a big stack in record time and said the chocolate chips were the perfect touch. This is such a fast and easy breakfast that’s perfectly doable for weekdays or try it for your next brunch or as breakfast-for-dinner when you’re wanting to change things up. Here’s a video that shows you exactly how to make them. 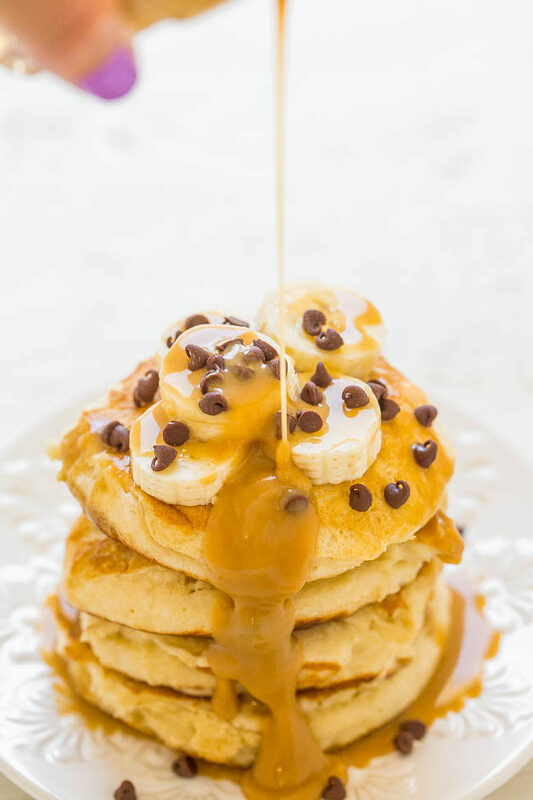 If you’re looking for extremely easy pancakes that are soft, fluffy, light, and pack extra protein look no further than this recipe. 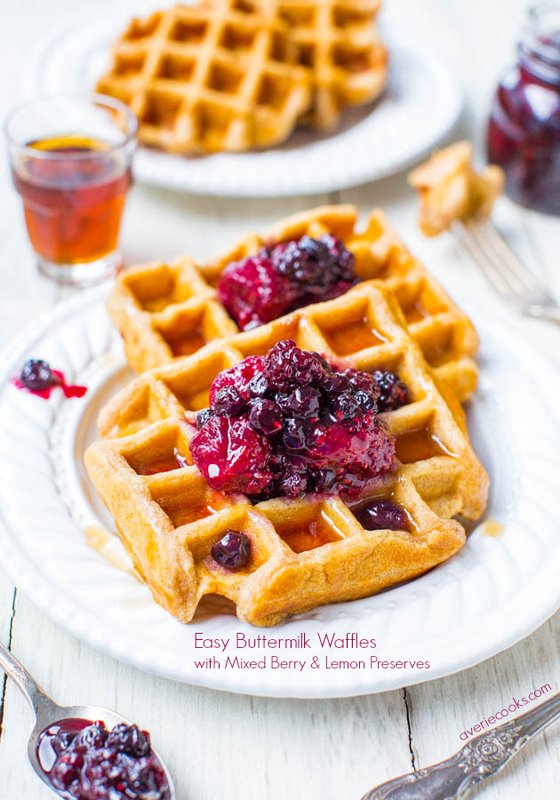 You don’t have to go out for buttermilk but can still enjoy the lovely taste of buttermilk pancakes with this mix – just add water. One serving of pancakes packs 13 grams of protein. I drizzled the pancakes with peanut butter that’s been infused into maple syrup. It’s decadent, rich, and the warm pancakes soak it up beautifully. I garnished the pancakes with bananas and I chocolate chips. To a medium bowl, add the pancake mix, water, and whisk to combine; don’t overmix. Batter will be slightly lumpy and on the thicker side. Let batter stand 2 minutes. Heat a griddle to 375F (medium heat) or heat a nonstick skillet over medium heat and generously spray with cooking spray. 15 Favorite Breakfast and Brunch Recipes – Fast and easy tried-and-true recipes that everyone will love! 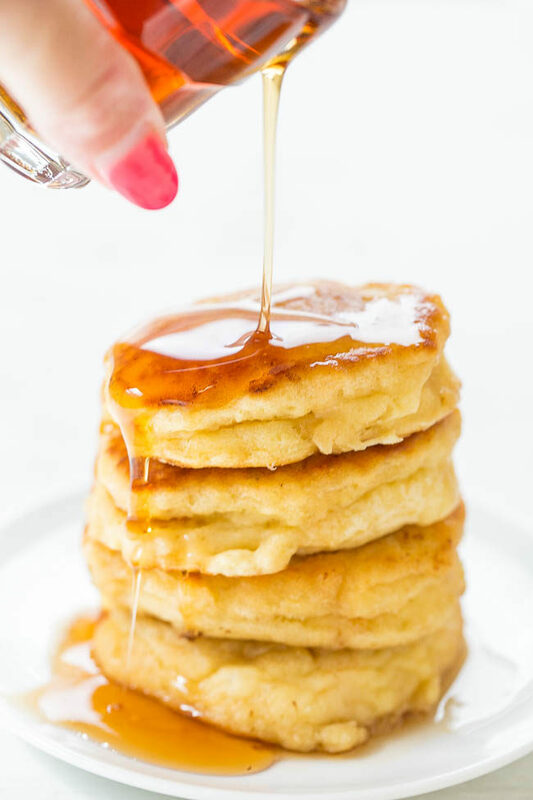 Thick and Fluffy Mini Buttermilk Pancakes – Your search for perfect pancakes is over! Easy, soft, fluffy, light, and the thickest pancakes I’ve ever made thanks to a special trick! French Toast with Peanut Butter Maple Syrup – My favorite recipe for classic French toast and the peanut butter maple syrup is to die for! 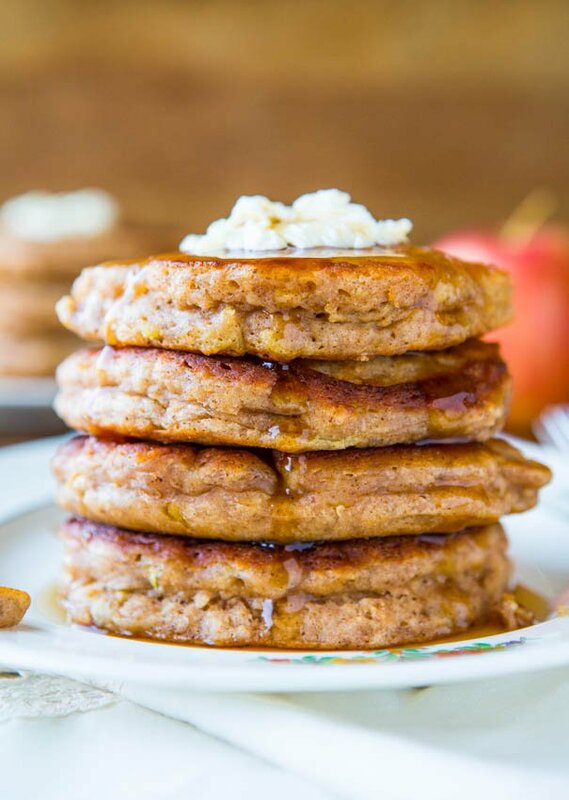 You’ll never settle for plain maple syrup again! 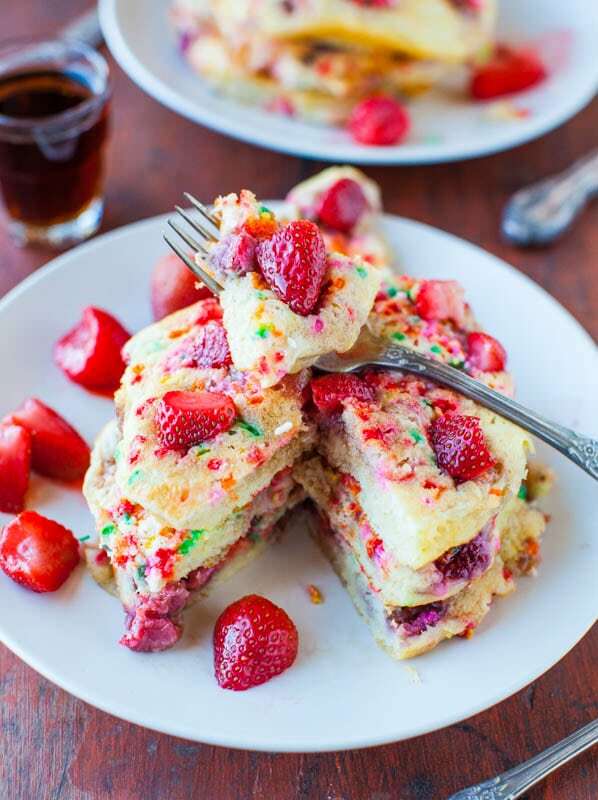 Strawberry and Sprinkles Buttermilk Pancakes – Who can resist pancakes, strawberries, and sprinkles! 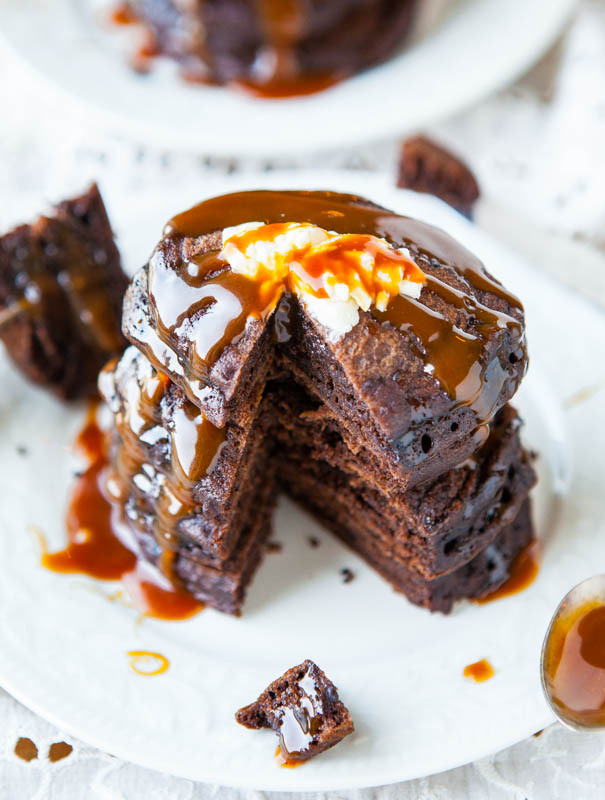 Chocolate Buttermilk Pancakes with Homemade Salted Caramel Sauce – Chocolate for breakfast paired with salted caramel sauce for the win! Post is brought to you by Krusteaz. The recipe, text, images, and opinions expressed are my own. I hope you’re enjoying your long weekend! I had never seen a pancake mix with extra protein either before this one. The PB maple syrup is seriously to die for delish! Okay the pancakes yes – love that mix – but the syrup. OMG. 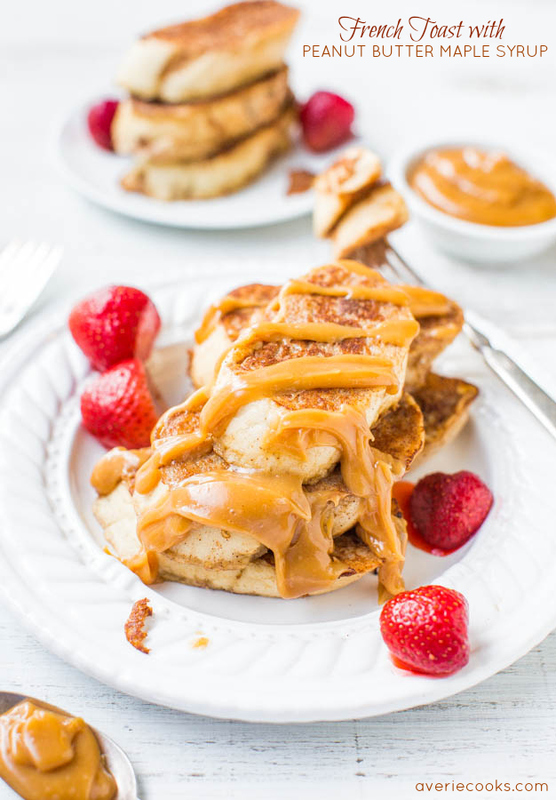 Peanut butter syrup. Gimme a straw, hold the rest! The perfect breakfast has been found. Right here. 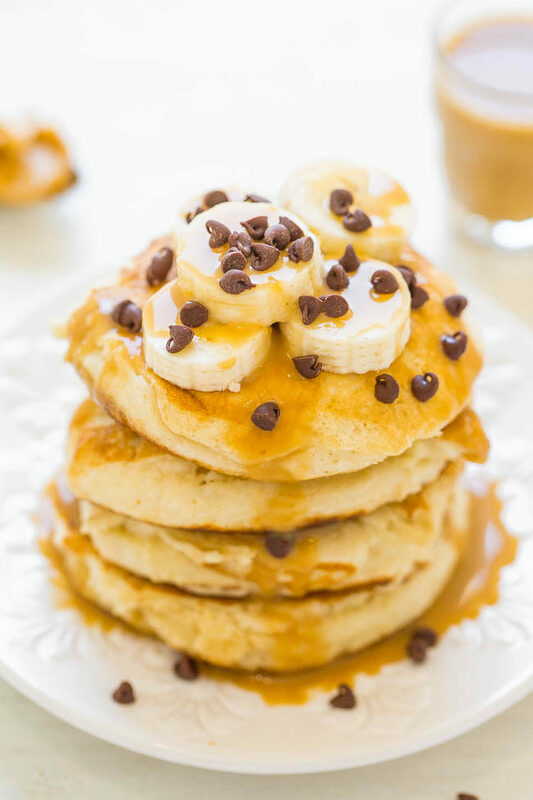 I am obsessed with pancakes and anything PB, so these are calling my name. MUST try them soon! Well now I want pancakes on a Monday night! Haha! Me too! Excited to see you soon! 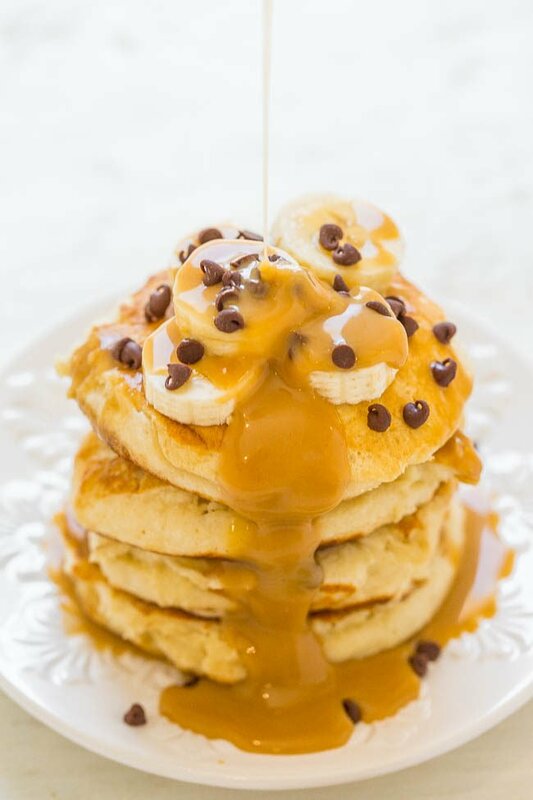 I’ve come across quite a few pancake recipes, put this one takes the cake. The pancakes themselves look so light and fluffy and extremely decadent. thanks for sharing this! 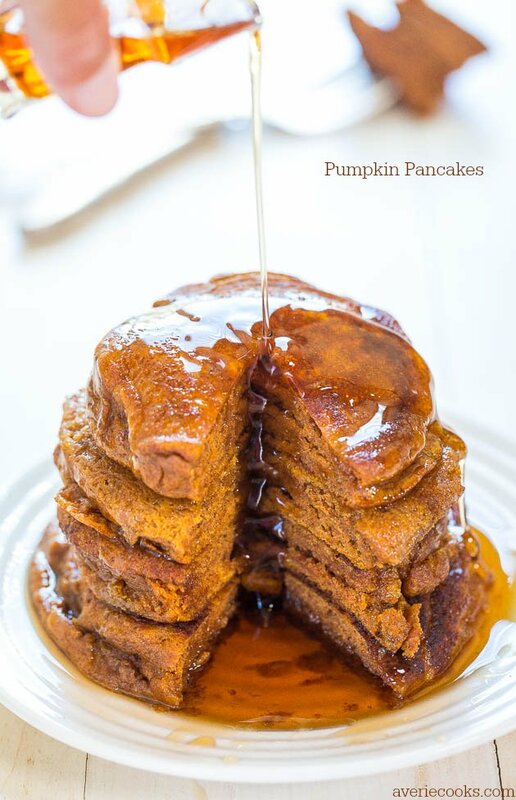 Averie Sunshine Krusteaz Buttermilk Pancakes look so good .Can hardly wait to make them. Thank you for this tasty recipe . 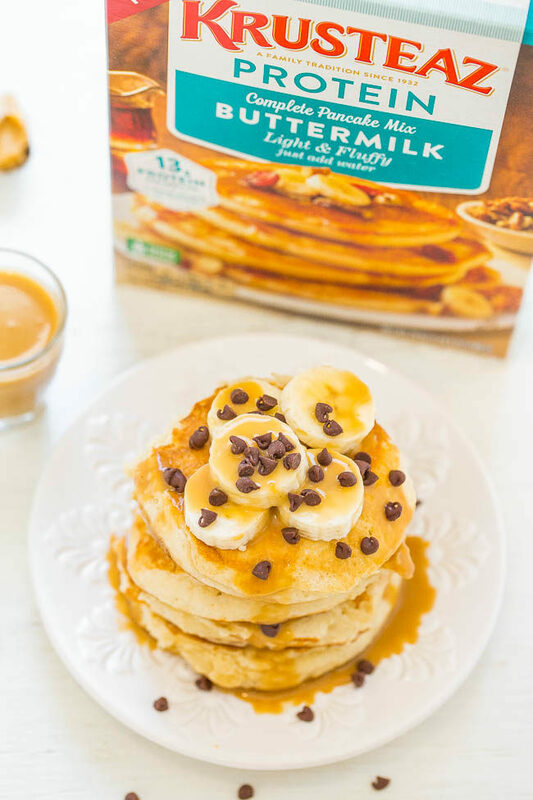 Thank you for this tasty recipe Krusteaz Protein Buttermilk Pancakes . Can hardly wait to make them.